Are you a sufi Shakh? Will you be my murshid? What is your spiritual lineage? My immediate spiritual and intellectual lineages do not follow the traditional Sufi silsila. Rather they are inseparably woven together and go back from Maulana Ansari to Dr Muhammad Iqbal to Maulana Jalaludin Rumi. 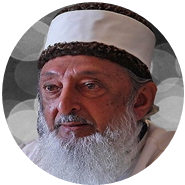 Maulana Abdul Aleem Siddiqui was the spiritual mentor of my teacher – but he has not played any significant direct role in my intellectual or spiritual life. I am, of course, poorer because of this. ‘The test of the pudding is in the eating’ – is an expression that accurately sums up the subject of Sufism. It is remarkable that none of the Sufi orders, to the best of my knowledge, have been able to recognize paper currencies to be a hoax, bogus, fraudulent and Haram. The pursuit of Islamic spirituality does not require joining a Sufi order. Such a thing might assist but is not a requirement for the pursuit of Islamic spirituality. I am not a Sufi Shaikh. I am not a Murshid in a Sufi Order. I no longer belong to any Sufi Order. My association with Sufism does not entail any belief or any religious practice that is not firmly founded on the Qur’an and Sunnah. We are all shepherds, and we will all be questioned about our sheep. In this sense I am a shepherd.